My apologies for my review on the dark chocolate pistachio toffee earlier this week, for two reasons: 1) I am clearly in the minority in regards to my opinion about the product and 2) In retrospect, after Nathan's reviews on both the Baby Bananas and the Apple + Coconut bars, it's apparent that this is simply fruit snacks week here. Let's not derail that train, please, and go full steam ahead with one of the newer taste sensations out there, Trader Joe's Sweet Plantain Chips! 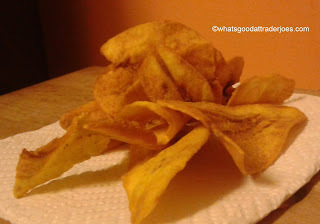 Particularly astute readers, undoubtedly like yourself, may be thinking right now..."Didn't TJ's already have plantain chips?" Short answer: Affirmative. But they are not sweet. Instead, the ones that have been around for quite some time are a saltier, savorier cousin of these noobs. Those are kinda like potato chips, except made from plantains (duh). These sweet guys, though similar in crunch and texture, are something else altogether. If for some reason you're not really sure what a plantain is like, every time you read it, think "starchier banana" and you'll be on the right path. I'm trying not to get hooked on them. Trying very, very hard. Plantains always have had a soft place in my heart after a trip I went on down to Peru back in 2003, where I ate fried plantains for breakfast every morning. And these chips are just about the sweetest variation I've found yet...and it's all natural! Nothing added! Except a little oil to fry them up in, of course. But, there's this whole write up on the back, where the plantains used for these crunchers were allowed to sweeten and ripen to twice the sugar level (apparently measured in something called "brix," I never heard of it either) of normal plantains. How much of that is marketing and how much is accurate, well, I don't know - but dang. Very, very sweet, in a very ripe sense of the way, almost like these fruits were just abound freezerbound for plantain bread before they got swooped in on, sliced, fried, and bagged. Sneaky. The end result are these oblong crispity-crunchety chippies that are arguably healthier than most potato chips, with an almost-not-quite-kettle crunch. They're perfect for kids, too - my 3.5 year old and almost 16 month old both love them, as well as some of the kids Sandy babysits a couple days a week. Also, they're very budget friendly at only a $1.79 for a fairly large bag. No real complaints from me, although perhaps a slight smattering of cinnamon would help cut through the sweetness and tamper it down a smidge. But man...good chips. Sandy's not as huge a fan as I am - she's eaten a couple and shrugged. This just might turn into one of those "more for me" kinda scenarios, and believe me, no complaints. Tasty but super crunchy - maybe too crunchy. Brix is a real thing. It's a measurement of the solids, which usually translates to sugars. Fruit that has a higher Brix degree value is more concentrated (and therefore, sweeter). But I haven't seen the label of this particular item, so who knows if letting it ripen past the usual Brix value is part of their process, or if it's just marketing. . . I love these! If you haven't tried them with guacamole you are missing out. It sounds odd, but it's amazing!